4.40pm Extreme Makeover: Home Edition. 6.40 Extreme Makeover: Home Edition. 7.40 Outnumbered. 8.20 Outnumbered. 9.0 Jonathan Creek. 10.20 sherlock. 12.25am traffic Cops. 1.20 Jackpots And Jinxes: lottery stories. 2.10 the Route Masters: Running london’s Roads. 3.0 Home shopping. 6pm 16 And Pregnant: From the First Kick. 7.0 FIlM: save the last Dance 2: Gtepping Up (2006) ★ ★ 9.0 Geordie Ghore: From the First taash. 10.0 Geordie shore: From the First taash. 11.0 geordie shore: From the First taash. 12 midnight Geordie shore: From the First taash. 1.0 Geordie shore: Why Aye love You. 5.25pm FILM: King Kong (2005) ★ ★ ★ ★ ★ Fantasy adventure remake, starring Naomi Watts. 9.0 FILM: The Dark Knight (2008) ★ ★ ★ ★ ★ 12midnight Family Guy. 12.30 Family Guy. 1.0 Family Guy. 1.30 American Dad! 1.55 American Dad! 2.25 The Cleveland Show. 2.50 Teleshopping. 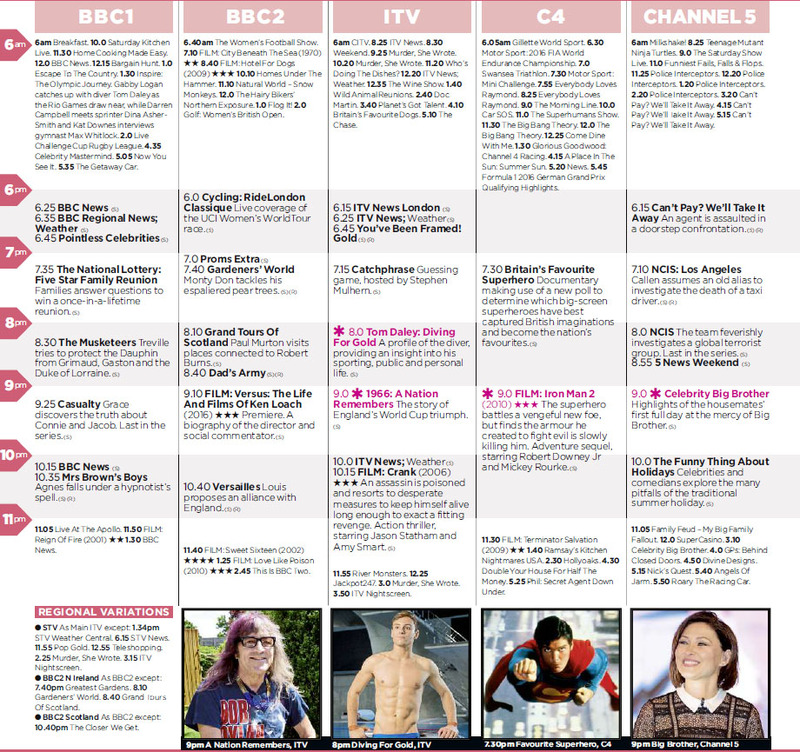 5.50 ITV2 Nightscreen. 6pm Say Yes to the Dress Canada. 7.0 Single Dad seeking. 8.0 Toddlers & Tiaras. 9.0 Undressed. 9.30 Undressed. 10.0 Devious Maids. 11.0 Mistresses. 12midnight Toddlers & Tiaras. 1.0 Undressed. 1.30 Undressed. 2.0 Devious Maids. 3.0 Say Yes to the Dress. 4.0 Say Yes to the Dress. 5.0 Say Yes to the Dress: Atlanta. 4.30pm FILM: gulliver’s travels (2010) ★ ★ 6.10 Rude(ish) Tube Shorts. 6.30 The Big Bang theory. 7.30 The Big Bang Theory. 8.30 The Big Bang Theory. 9.0 FIlM: Rush Hour 3 (2007) ★ ★ 10.45 Gogglebox. 12.55am Rude Tube. 2.0 First Dates. 2.55 Gogglebox. 3.50 2 Broke girls. 4.10 2 Broke girls. 4.30 Rude(ish) tube. 4.50 Revenge. 6pm Modern Family. 7.0 Modern Family. 8.0 Agatha Raisin. 9.0 The Simpsons. 9.30 The Simpsons. 10.0 FILM: Underworld: Evolution (2006) ★ ★ 12midnight A League Of Their Own. 1.0 Karl Pilkington: The Moaning Of Life. 2.0 Brit Cops: Law & Disorder. 3.0 Road Wars. 4.0 Border Security: Canada’s Front Line. 6pm Dinner Date. 7.0 Dinner Date. 8.0 Dinner Date. 9.0 Dinner Date. 10.0 The Real Housewives Of Atlanta. Kandi makes an announcement that stuns her daughter. 11.0 The Millionaire Matchmaker. Patti Stanger organises a makeover and counselling. 12midnight The Jeremy Kyle Show USA. 12.55 Teleshopping.